It’s almost more than 22 years that Pokemon cards came into existence and since then their craze among the kids are growing each day. The truth cannot be denied, we all love collecting the Pokemon cards and defeat our opponents with the power and defense of the pokemon cards we are having. 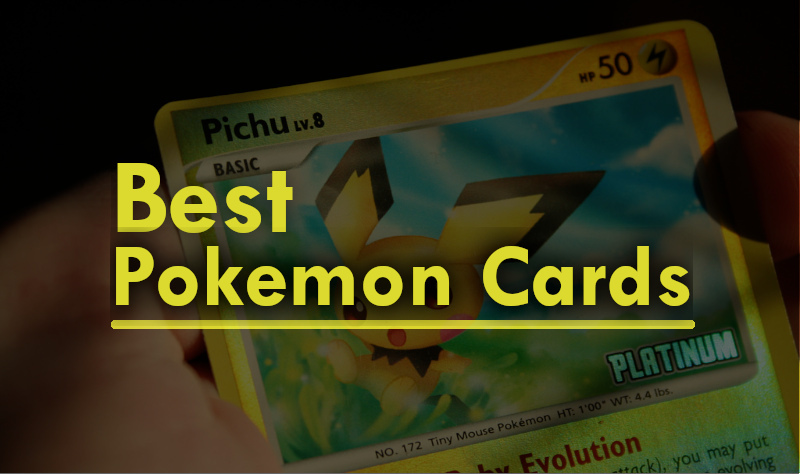 But, the question remains the same, what is the best Pokemon card in the world? My answer to this question would be – The Best Pokemon card is the one which has the maximum power, such as attack and defense. Considering both of these values, it is Shadow Lugia, with an attack power of 1000 damage and has 300 HP (Health Points). Since it is not the only card which will help you win the battle against your opponent, there are many more cards from different generations holding different sets of power. So let’s have a detailed look at the list of top most Pokemon cards available in the market for your buying. Here is the list of all the best Pokemon cards available in the market including the strongest and the rarest Pokemon card in the world. 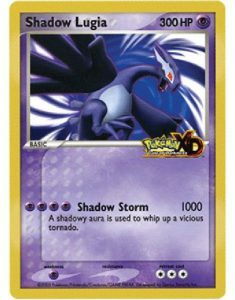 Shadow Lugia was originally released as Jumbo card and this card is not legal to use in official tournaments or events. This card also lists the logo from Pokemon XD: Gale of darkness. It was released in October 2005 in New York. Today this card is the strongest pokemon card with an absurd damage point of 1,000 but it is not possible to use this legally. The highest tournament legal pokemon attack does 300 Damage. The Next Pokemon on the list is Mega Venusaur EX. 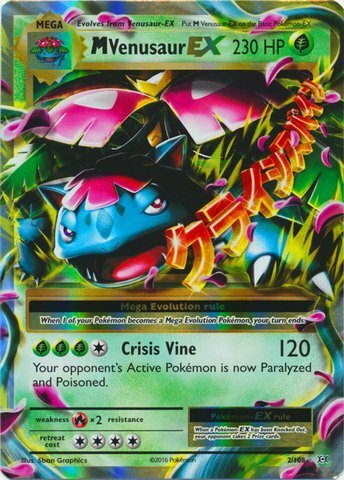 It is a Grass-type Mega M Pokémon-EX card and was first released as a part of XY expansion. This Pokemon does an amazing job when it comes to playing the role of defender, his attack of 230 Hit points can poison or paralyzes the opponent giving you enough time to think upon your next move. 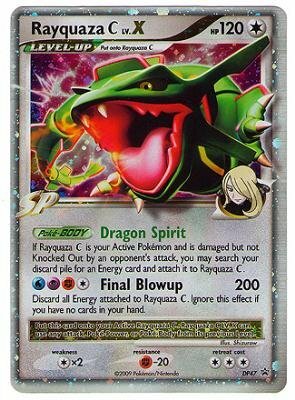 Rayquaza C Lv. X is one of the unbeatable Pokemon cards you really want to have in your collection. It has the hit point of 120, but its final blow can cause a great damage up to 200 hit points which is enough to knock down any top Pokemon card. The only drawback of this legendary dragon Pokemon is that it takes at least three energy cards to use its final blowup attack. But for that, you can choose any three energy cards from your pile of discarded cards as long as they have not fainted. One of the most awesome things about this Pokemon card is that it can use Poké-Body, Poké-Power or attack from its previous levels. The next Pokemon on the list of Best Pokemon Cards is Charizard G Lv. X. This Pokemon is well known for his special move of 120 HP, Call for Power, which can cause an immense damage to the opponent. 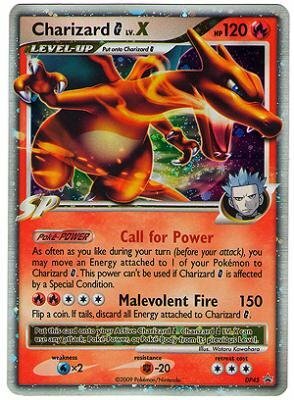 The thing that makes this Pokemon card a fan favorite among the Pokemon Trading Card Game is that you can use all the previous attack, Poké-Body or Poké-Power by attaching Charizard G Lv. X card with the Charizard G.
When you use Charizard G Lv. X, you can move energy cards from other Pokemon to your Charizard and get a staggering 150 damage. 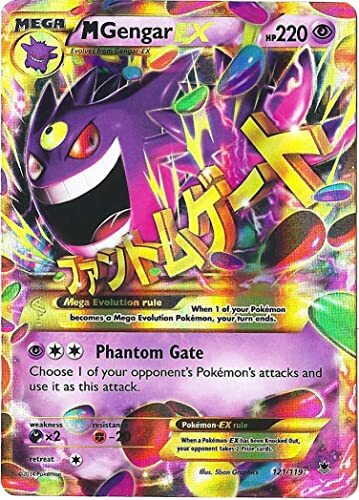 Another Pokemon Card that you should include in your collection of Pokemon cards is M Gengar EX. The main power of this pokemon is the Phantom Gate. Anytime during the game, if you use this power, you can choose one of the moves of your opponent’s Pokemon card and use it against him. Overall, M Gengar is an incredible ghost type Pokemon card which has the huge potential of destroying the opponent’s Pokemon with the huge HP of 120. 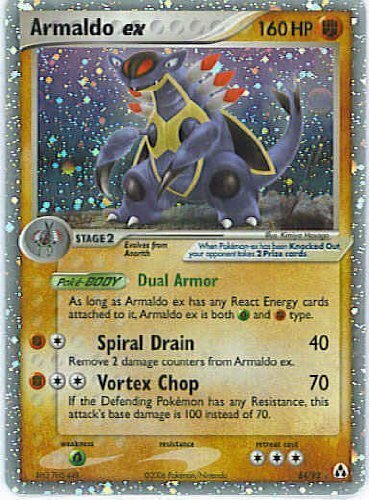 Armaldo EX is a versatile Pokemon card. It helps the player to fight in different combat situations. Armaldo has got the HP of 160 with a special ability to heal with his Spiral Drain attack. The Poké-Body and Dual Armor of Armaldo give it a dual characteristic of grass and fighting when any react card attached to it. The overall quality of Armaldo makes it a perfect match for the defender as well as the attacker all in one package. Mega Blastoise EX is a great Pokemon card to include in the collection. 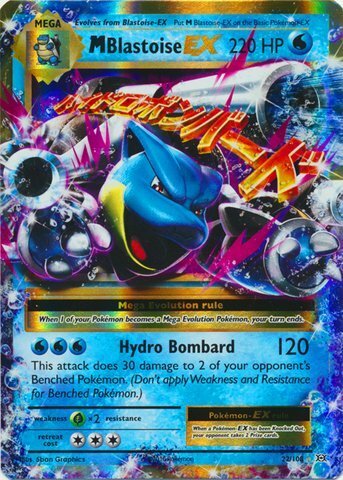 It can cause a Strong attack to two of your opponent’s benched Pokemon with 120 HP and an additional damage of 30 HP when you use its real power of Hydro Bomb. Mega Blastoise EX works on the mega evolution rule, it means you end up losing your turn when one of your Pokemon mega evolves. 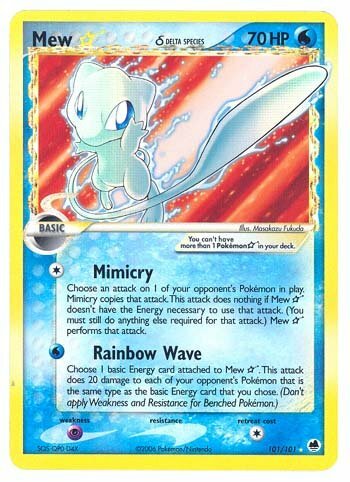 Mew is a delta species card. The Unique thing about the delta species card is that they give Pokémon irregular typing. Shining Mew Pokemon card is a nightmare for those opponents who have many pokemon cards of the same type. The Rainbow attack of Shining Mew let the owner cause 20 HP damage to the opponent’s Pokemon of the same type. All you have to do is to attach Mew Pokemon card with one energy card and one water card. On the other hand, the Mimicry power of Shining Mew gives you the option to replicate the attack of one of the opponent’s pokemon but for that, you must be having the energy card used for that particular attack. 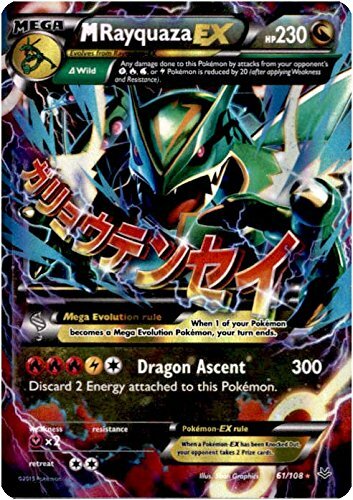 Mega Rayquaza EX is one of the most interesting Pokemon cards you could have in your Pokemon card deck. It’s Dragon Ascent attack which can cause 300 damage with an incredible HP of 230 makes it one of the strongest Pokemon card you can buy. But as we all know with great value comes the great price, to use the deadly dragon ascent attack you have to discard any two energy cards from your collection of cards after you made the attack. As this card is in the mega-state so it requires other cards to get evolved and then actually it will help you win the battle against your opponents. Rare Candy Pokemon card is an important trainer card. It helps the player to take out much more versatility of the Pokemon cards in their deck. 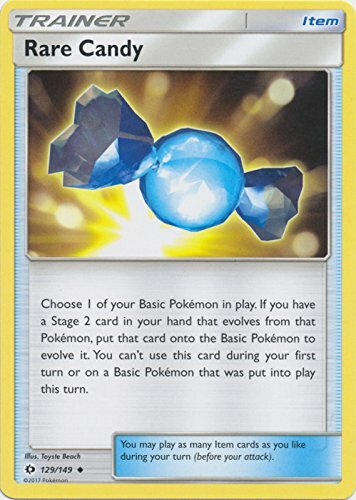 Whenever a player encounters this Pokemon card during the game, he can choose any basic stage pokemon and evolve it to Stage 1 or Stage 2 for better versatility and more powers. Mega Tyranitar EX comes with the same mega evolution rule as mentioned above for other Mega Pokemon cards. This Pokemon has only one deadly attack called Destroyer king. 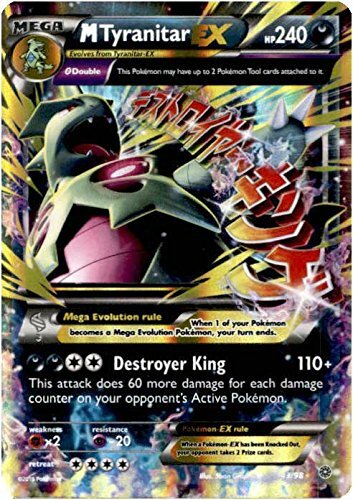 The Destroyer king attack can cause the damage of 110 with an additional damage of 60 on the opponent’s active Pokemon. Destroyer king attack of this Pokemon makes it one of the best Pokemon cards ever. If you want to use this Destroyer king attack, you have to use two darkness energy cards and two colorless cards. Charizard is the most famous anime in the Pokemon Series along with Pikachu and few others. And in the game also, it is one of the strongest Pokemon without a doubt. It has an HP of 180 and carries two of the best moves, stroke and Fire Blast. Firstly, we will discuss Stroke move. 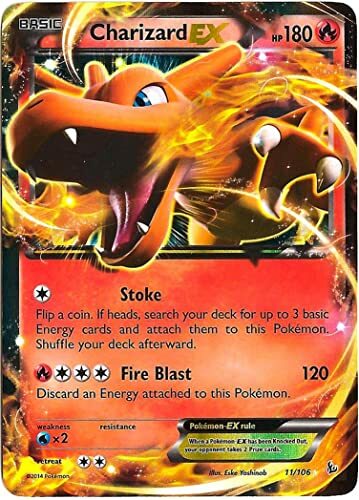 Stroke move requires 1 colorless energy card, if you get heads then you can attack three basic pokemon cards from the deck and attach all of three with the Charizard EX pokemon card. But Wait, the second move is much more special. The fire blast move can cause a damage of 120 and after using this move you have to discard one energy card from the deck. This move requires 3 colorless energy card and 1 fire card. 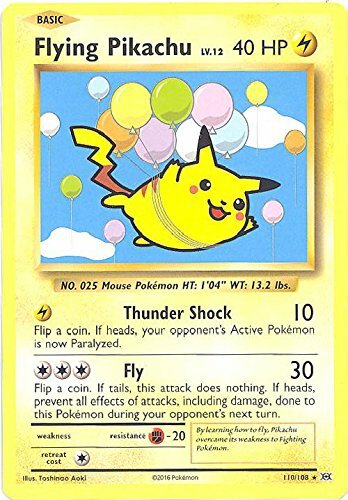 Flying Pikachu is simply not one of the most useful cards you can have in your collection but certainly one of the most exciting and rarest cards you really want to have in your collection of Pokemon cards. Flying Pikachu card comes with 40 HP and two types of attack, the Thundershock and Fly attack. The Thunder Shock attack can paralyze your opponent’s pokemon whereas FLy attack can make you earn 30 damage points. No doubt, Flying Pikachu is one of the famous character Pokemon card among the kids. What are the different types of Pokémon cards? Character Cards: Each Pokemon card you purchase belongs to a particular type such as Fire, Water, Psychic, Normal or Dragon. How much energy your pokemon card holds is entirely dependent on how evolved it is – basic form, Stage One form or Stage Two form. Legendary pokemon cards are the most powerful cards in the entire range of pokemon cards and mostly a much-needed desire for any kid. They only found in booster packs. Energy Cards: The Energy Cards boosts your other pokemon card’s energy from time to time throughout the game. You will find energy cards in almost any pack of pokemon cards you buy. There are also few special energy cards which provide special power to your pokemon card, depending on the type of card you have. Trainer Cards: Trainer cards are those cards you use for supporters and stadiums you can opt for during the battle. The rules of these cards are indicated at the bottom. Q1. What is the most Valuable Pokemon Card? Numbers 1, 2, 3 Trainer Cards. Q2. What is the most Powerful Pokemon Card Ever?